In order to facilitate improved diagnostics using current and past treatment parameters and performance/health indices, cyberREN provides four User Defined Flowsheet displays. A Flowsheet is a group of related or interdependent treatment parameters, which can be displayed together on a common time scale, allowing the caregiver to observe trends and interrelationships between the various elements of an individual UDF. Each set of flowsheet values (first column in the flowsheet) are time stamped and may be presented in a tabular or graphical format. cyberREN users no longer find it necessary to search through several sections of the chart for related information when using cyberREN flowsheets. A flowsheet can display up to 20 numerical values from almost anywhere in the cyberREN medical record, and shows the date of values, measurement or entry. Flowsheets are automatically populated when they’re called up; a column exists in a flowsheet for every date on which a change or new value for any flowsheet member can be found in the medical record. 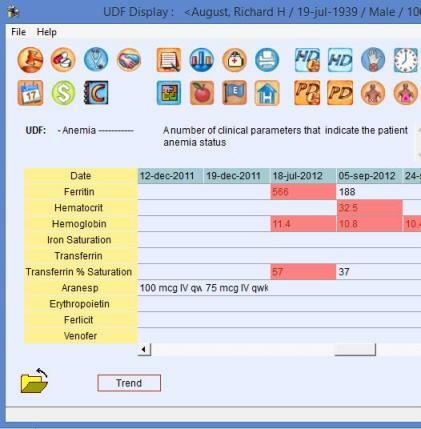 The unique ability of the electronic medical record to present data from various chart sections adds value to the data in the chart, by pulling it together and presenting it in a concise, meaningful way. The caregiver can define his / her own personal combination of results to display in a flowsheet, and can make the flowsheet available to other cyberREN users if desired. A sample flowsheet is shown on the right. Both the tabular and graphical flowsheet displays, called up through one of cyberREN’s icons, may access other related sections of the cyberREN chart, allowing the user to view more detail, or to modify orders resulting from intelligence gained by viewing flowsheet information.